I recently decided to give iTerm another try after one of my friends recommended it to me. I had tried it several times before, and never quite gotten used to it. I always seemed to prefer Visor + Terminal for some reason or other, but since I've setup a global keyboard shortcut to focus / open iTerm, I've been enjoying having a tabbed terminal. I tried doing all sorts of things to setup something similar in iTerm, like using a .inputrc file, until I finally figured out how to do it. Next to Mapping, click the + sign. For Key, choose cursor left. Write b in the input field. 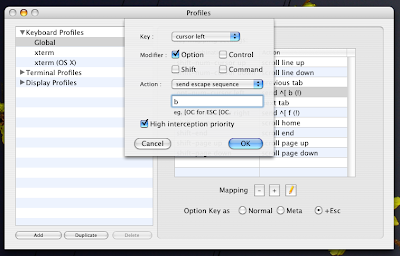 I also checked High interception priority for good measure. For Key, choose cursor right. Write f in the input field. I also checked High interception priority here for good measure. 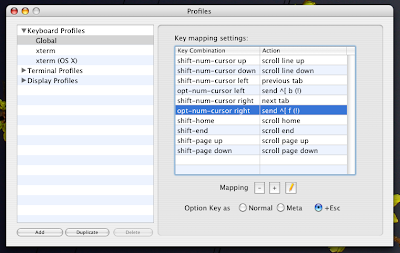 Now you have some sweet keyboard navigation action.